248 pages | 137 B/W Illus. "Concrete structures are continuously exposed to environmental effect, leading to degradation of concrete and corrosion of steel. This is a worldwide problem. FRP has been increasingly used to rehabilitate and retrofit reinforced concrete structures. 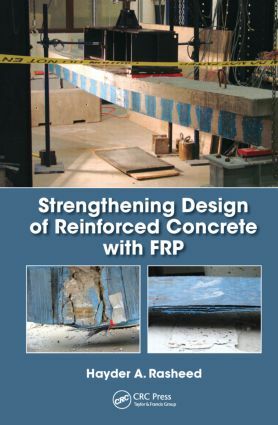 Although design guidelines have been developed in several countries, there is still no comprehensive textbook on strengthening concrete with FRP. Thus, this book is in time. It will benefit not only university students, but also engineering communities." Hayder A. Rasheed is a professor and Thomas and Connie Paulson outstanding civil engineering faculty member at Kansas State University, Manhattan, USA. Previously, he was an assistant professor at Bradley University, Peoria, Illinois, USA. He holds a BS and MS from the University of Baghdad, Iraq, and a Ph.D from the University of Texas at Austin, USA. He is an ASCE fellow, registered professional engineer, author and co-author of 3 books and more than 50 refereed journal publications, and editorial board member of the International Journal of Structural Stability and Dynamics and the Open Journal of Composite Materials.